Latest Indian Navy Recruitment jobs 2019: The Indian Navy is a well-balanced and cohesive three dimensional force, capable of operating above, on and under the surface of the oceans, efficiently safeguarding our national interests. Indian Navy has three Commands, each under the control of a Flag Officer Commanding in Chief. The Western and the Eastern Naval Commands are ‘Operational Commands’, and exercise control over operations in the Arabian Sea and the Bay of Bengal respectively. Every year huge no. of openings are available in the Indian Navy recruitment. Candidates who are searching, seeking the information in this field. just Grab this opportunity this is for you guys. those who are having minimum eligibility criteria can apply for this job. 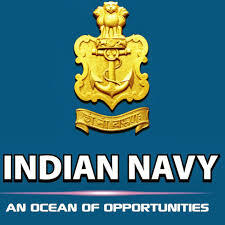 We are here to give you previous papers, syllabus exam pattern and give information regarding these Indian navy jobs. So all this information can use and make it as your preparation. Jobschat is a hub for all Government & Private Jobs in India Latest Indian navy Recruitment 10th Pass,12th Pass & Engineers, Results, Admit cards, Cut off marks, Application forms, Selection process, Syllabus, Placement papers, Previous Papers, Study materials, Tips.